Have you ever wanted to grow peas in your garden? Want to save some money at the supermarket because man those sugar snap peas are expensive. You will find a treasure trove of growing pea garden tips to help you get your green thumb. You will have so many peas that your old aunt’s Pea Soup recipe will be a dance in your mouth from your garden peas you grow. See if you discover our insider secret tips on how to grow peas. Growing Peas is easy to do and one of the first vegetables you can plant in the spring or late in the summer. You simply sow your peas when the soil temperatures are at least 60°F (16°C) or above. They prefer a spot in full sun to part shade. It is best to inoculate the pea seeds with a bacteria called Rhizobia for new garden beds or you can provide some rich vermicompost. Ideally, you need some form of a trellis to make it easier to grow. The peas are typically ready to harvest within 7 to 10 weeks. The following pea growing garden tips are geared for growing your peas in your garden soil beds via direct sowing. You may also grow the peas in a container, but you want to ensure you can have some type of vertical trellis. Some of the vines can get pretty tall, so be aware of that when choosing your container. You may want to place your container of pea plants next to a built-in trellis. 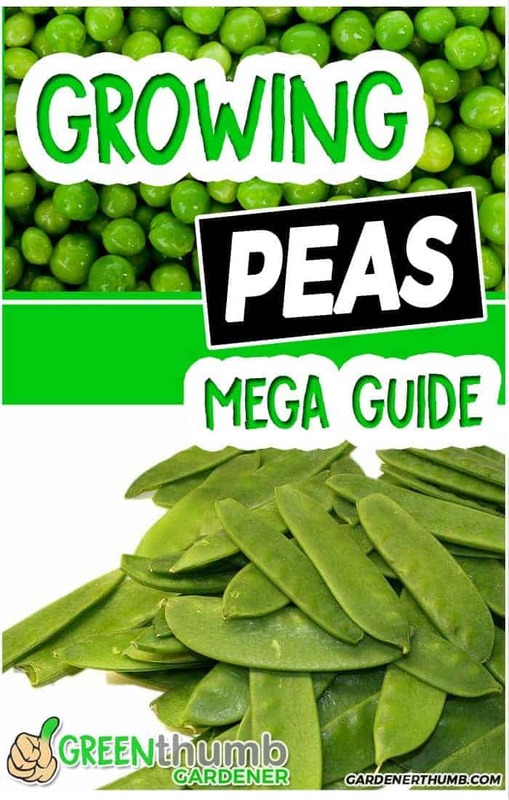 Check out our guide to growing peas in a container here for more information. Peas (Pisum sativum) was found mostly in Eastern & Mediterranean Europe from as early as 4800 BC. They are among the earliest types of cultivated vegetables that are known to have been grown. There were even reports of evidence being found in mud sites near Bronze Age Swiss lake dwellers that are believed to be about 5000 years old. These were mainly dried and used in some of the many food staples during those times. The Romans actually thought they were poisonous if eaten fresh instead of dried. Crazy they missed out on some killer snap pea stir-fry dishes. The French really popularized eating fresh peas in the 1600s when King Louis XIV became a Green thumb Gardener. He was growing peas like a boss back then. Here is insider secret #1, the French are not known for their beans (French cut beans), but their innovation of peas. 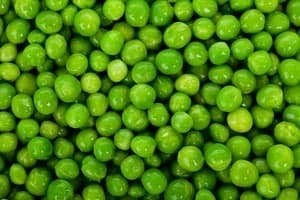 In modern times, you will peas are eaten fresh, steamed with butter and paired up with carrots like Forest and Jenny. They come eaten in pods, shelled, and range from mildly sweet-savory to really sweet. You will see pea pods lavishly used Asian stir-fried dishes and fresh peas will speckly many popular Indian dishes. You also can’t leave the southern US without trying some split pea soup flavored with a hammock. All this writing about peas is making me crave a spicy stir fry with snap peas. You might wonder how can add to the legacy of peas. You can do your part by planting a variety of peas plants in your garden this spring and fall. It is a so simple to grow these lovely little green spheres of sweet bliss. Trust me, there is nothing like picking fresh pea pods from your garden and eating before you can make it back to your kitchen. The kids love them as well, so they don’t make it far, so plant more than you think you need. There are way too many reasons why you need to grow peas in your garden. First off, they are one of the earliest crops out there that you can grow. Imagine picking peas from your fresh garden outside in late February to early March. Yes, if you live in areas near the equator (think Southern US), then your soil could reach the optimal temperatures to plant. Ideally, a spot in the most sunlight would be best to grow them faster since the sun is out less during this time. Nature’s own daily multivitamin– Peas are packed with phytonutrients, minerals, vitamins, and antioxidants. Not to mention that 100g of peas provides 16% of your daily folic acid needs and 67% of your vitamin c (take that…oranges). Let’s get down to the dirt with the best way to plant your peas in the garden. You will find an easy step by step guide below. 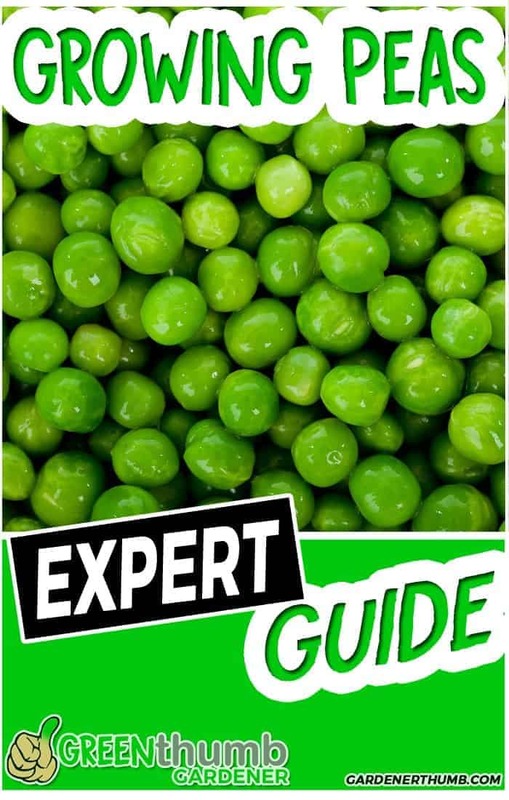 This guide is mainly focused on planting peas directly in your garden. You alter some of these steps to plant them in a container if desired. Just keep in mind that you will also need a trellis of some sort in your container for peas to grow healthier. Pea seeds – Check out a few of the varieties below for the different types of peas you can start from seed. Keep in mind the days of harvest as there are some early and late varieties of pea plants. 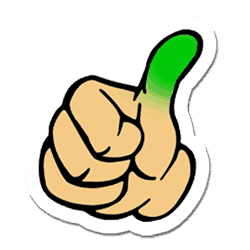 Fertilizer or compost– Giving the peas a good start of nitrogen is definitely needed if you don’t use the inoculate. Trellis– You don’t need anything fancy, but just keep in mind that peas plants do better with some type of trellis to climb up. It is worth noting that peas can suffer from powdery mildew if left to grow on the ground, so your harvest will not be as abundant if no trellis is used. Start by identifying the area that you want to plant your peas in. Ideally, a place that has full to partial sun with a trellis in place. Work in your compost or fertilizer into the soil prior to planting. This will help ensure that you have a good supply of nutrients to promote growth for your pea plants as they sprout. Dig a small trench alongside your trellis or poke a 1″ hole in the dirt for each pea seed that you want to plant. Pea seeds need to be sown about 1″ apart from each other at a depth of about 1″. Note: You want the pea plants to be close enough to reach your trellis. This will ensure that the plants can easily attach to it once they start growing. Inoculate the pea plant seed with the bacteria if you chose to use this. Place your pea seeds about 1″ apart in your trench or in each hole if chose that method. It is best to follow the recommendations on your particular pea seed packet. You won’t go wrong with about 1″ apart though. Next, you want to lightly cover your seeds with up to 1″ of sifted soil. The optimal depth for growing lettuce is about 1/4- 1/2 inch. Lightly water the top inch of soil once your pea seeds are covered. You want to moisten the pea seeds enough to promote & ensure optimal germination conditions. We recommend to let the peas sprout and grow for 5-10 days before you add liquid fertilizer to your pea plants. You can harvest peas in about 3-4 weeks after your pea flowers blossom. Check your seeds packet to find out the recommended harvest time. Typically, it is about 7-11 weeks from seed to harvest. Factors that will cause this to vary are soil temperature and amount of sunlight. Check out this video below about how to plant sugar snap peas. While we plant sugar snap peas, this is also relevant for any other types of pea plants. Are Pea Plants able to be transplanted? Some vegetables are perfect candidates for getting a head start, but it is not always the case for every one of them. This is due to the stress that can be brought on by transplanting. Some vegetables don’t do well when their roots are disturbed or placed in a new growing environment. Pea plants are in the grey area. It is best to direct sow them, however, the pea plants don’t necessarily get too stressed when transplanting. Many gardeners had success starting their pea seeds early indoors and then transplanting them once the soil temperature has warmed up to optimal temperatures. Personally, I have not needed to do this because of our growing zone. Being in zone 7b has the advantage of having mild winters. We actually plant in early fall and continually harvest until the heat arrives next summer. Our harvest is very light during the winter if we planted them in late summer (peas don’t grow well in the heat) but really perks up in late February. That being said, if you are in a more Northern area (those above the equator), then I would give it a shot. It is recommended that you immediately transplant them as soon as you can because the root system is much different in some varieties and they have a fair chance to do well if they are root bound in your seed tray. Powdery Mildew Prevention– Peas are susceptible to this type of mildew as they get wet. A trellis keeps it off the wet ground and also promotes good airflow in between the vines to allow proper drying after they get wet. Trellis structures can be very simple designs and do not have to be complicated builds. You can use chicken wire or a nylon netting. There is also some more natural and rustic pea trellis where you use a bush or tree for the vines to climb. Check out this video guide below that shows you how to build a trellis that can be used for your garden peas, sugar snap peas, and snow peas. The answer to this question really depends on how soon you want to harvest your peas. Ideally, peas prefer a location that does get full sun. The peas can still grow well in partial shade but it may extend the time to harvest. That being said sunlight that ranges from 4-8 hours is usually the sweet spot for growing peas. This is so why the peas may not grow much during the winter months because the days are shorter thereby it could possibly decrease the amount of sunlight in the location. Keep that in mind if your garden area is surrounded by trees or other structures. The position of the sun changes as the season cycle through. Another factor to keep in mind with the location is susceptibility to wind. Some pea plants will form a thick clump of vines that can put stress on the trellis. It is not a big detriment, but just keep that in mind if your trellis structures are not sturdy. St Patrick’s Day always seems to be the time that to think about growing peas in the springtime. In most parts of the US, this day is a good reference. Snow has melted and your ground may be ready to work. Certainly, don’t wait until that date to get them but use it a reference to planning. Ideally, the soil temperature is the biggest indicator of when the best to plant peas are. The seeds may not germinate until the soil reaches 60°F. You can try and germinate the seeds indoors and plant, but just keep in mind the growth may be slow. Nature has a way of activating life for its environment, so cheating does not always work. You can also plant peas in the late summer and early fall period. Unfortunately, pea plants don’t tolerate heat very well. In fact, the flowering of the plants is greatly affected by the soil temperature. At the time of writing this, our October temperatures are much warmer than normal for this time of the year in zone 7B. Our pea plants have not taken off as they usually have. Fortunately, the nights have been cooler. It was necessary to mulch heavily & water a bit more to keep the pea plant roots much cooler. You might be thinking can’t I just stick my plants wherever they want to grow. While this is true, nature has a way of promoting mutual cooperation amongst many life forms. This is also true for the plant world. There is some science in play with this as most of the plant magic happens below the surface of the soil. That being said these are not hard fast rules. We have onions that are planted on the outer edges of our garden to help deter some pest, rabbits, and deer. The peas that are near them seem to still grow. Pea plants tend to be pretty easy to grow. We find that they don’t need much fertilizer during their growth cycle. You only need about a 1/2 inch of water per week until they flower. You really want to make sure that there is even watering from seedlings to the flowering stage. Never let them dry out as it will reduce yields. Once they flower, you need to increase your water to about 1 inch per week until their pods fill up. Not much fuss with these guys before they flower. Peas do not need any fertilizer during their growth periods. This holds true as long as the soil that they are sown in is fertile. You should as a good practice have soil that is rich in humus and mixed in with good compost. You may also give it a boost of Nitrogen, maybe a fish emulsion, during the 1 week of it sprouting to help it get going. Peas are one of the vegetables that pull nitrogen on its own once it starts growing. When your pea plant dies after you harvest, cut the vines and leave the bottom section and the root still planted. The remaining nitrogen stored in the plant will be released back into the soil. 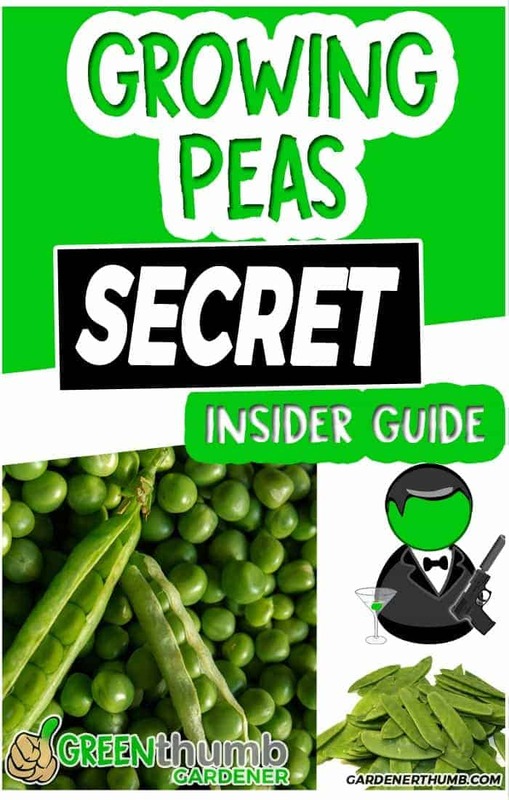 Peas are a nitrogen building beast which is insider secret #3. Mexican Bean Beetles – They look like little yellow ladybugs, but will tear your crops up like Japanese Beetles. They usually are found under the leaves. Powdery Mildew– A fungal disease that is brought on by the warmer weather, so this may only show up later in the spring after moist conditions. A trellis will help with airflow. Fusarium Wilt– a Fungal disease that turns the plant yellow, then brown that causes them to shrivel and die. This is where we get to taste the fruits of our labor. You will see that the flowers have formed into pods and starting to fill out. You want to give nature its chance to almost complete its cycle. Snow Peas are best to pick a little early in my opinion. You don’t want the peas to get too full as they can get a little chewy. These peas freeze well after you blanch them in boiling water for 1-2 minutes. Lay them out on a tray after they have cooled from an ice bath and stick them in the freezer. Sugar Snap Peas are plumper than the snow peas, but not as full as garden peas. Pick them just before they are bulging. You can remove the string from the pea pods or leave them if you like. Sugar Snap peas also freeze well after you blanch them like Snow Peas above. Saving seeds is probably one of the most beneficial skills you can learn as a gardener. Not only does it allow you to replant the same varieties the next year and save you money, but it ensures survival. Pea seed saving is very easy to do and a way to save a legacy to pass on. Here are a few tips to help. You want to pea seeds to actually dry directly on the vine. Their cycle ends as summer is just starting, so it should not take long to allow them to dry out. Pea seeds can be stored for about 3 years if stored in ideal dry, dark and cold conditions. Here is a list of the different varieties of peas to grow in your garden. They are grouped in the 3 main varieties of peas: Sugar Snap Peas, Snow Peas, & Garden (Shelling) Peas. These types are also best for heirloom or open-pollinated plantings to ensure you can save these seeds for planting future pea crops. Oregon Sugar Pod– A Mild flavored variety. Plants are generally about 2 ft and pods are about 3-4 inches. This is Green thumb Gardener’s choice. Sugar Ann– A very sweet variety with pods that are 3-4 inches. Golden Sweet Snow Pea – Produces beautiful bright yellow, green pods. Vines are about 6′ and adorn purple flowers. Originated from India. Mammoth Melting Sugar Snow Pea – Very popular, heirloom variety. Large, sweet pods with vines that grow approx 4′. Thrives in cooler weather. Oregon Sugar Pod II Snow Pea – Large thick pea pods, grow in a bush plant and is high yielding. A Green thumb Gardener favorite. Alaska – Staple variety introduced in the late 1800s. Plants are about 2-3′ tall. Pods are 2-3 inches long with smooth light green peas. Lincoln– Also known as the Homesteader., excellent flavor and does well in cool climates. Kelvedon Wonder Garden Pea – Super early dwarf type that produces early. Perfect variety for container planting that produces a heavy crop of small sweet peas.